FLiP is our annual zine. 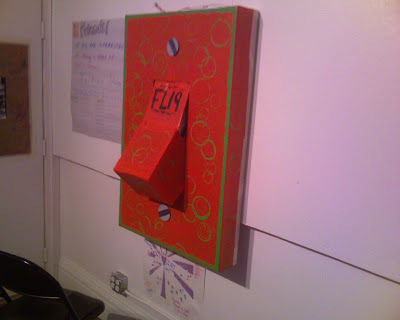 A collection box sits in our studio for students, mentors, whoever-- to contribute drawings, writings, photographs, whatever to go in our annual publication. 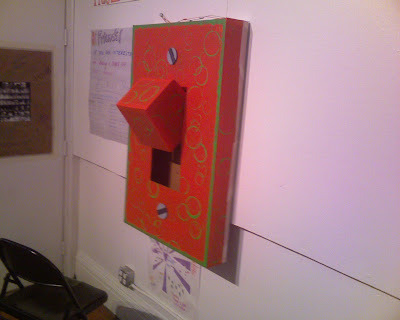 Each year the submission box takes on a new look, some kind of giant, orange electrical devise. It's been a robot named Muncho, a nintendo (FLiPtendo), an iPod, and this year...it's a working light switch! making valentines from New Urban Arts on Vimeo. Collaborative drawn animation by Donna, Abby, Maddie, and music by me. What does teaching and learning look like in our studio at New Urban Arts? What is the role of artist mentor in building this learning community? How do meaningful mentoring relationships develop, when they begin from a place of authenticity rather than authority? How does the idea of a lifelong creative practice resonate with you? How will you introduce your creative practice to the studio community through the mentor exhibition? Artist Mentors are introduced to the Creative Practice Rubric, an instrument that measures the progression from introductory and emerging levels to established and sustainable levels of creative practice. How do we critique artwork in ways that better support the artist's creative practice, rather than only better the artwork itself? Artist Mentors are introduced to the critical response method of critique developed by MacArthur Genius Liz Lerman. From what sources do you pull your creative energy, worldview, perspectives and passions? How is your creative practice an outgrowth of your personal history, geography and family? How is your personal story and personal experience related to your practice as an artist? As a mentor? What is the nature of the relationship between you and your students? How are they supported? How do they support you? How do we balance building authentic relationships and being inclusive? What have you learned in your experience here so far about yourself - As a teacher? As a learner? As an artist? How do you listen to and acknowledge the questions and perspective of anyone regardless of age? What if you could rewrite a dialogue as you wish it would have been? Artist mentors are introduced to theories of adultism and strategies for communication with youth. What are the values that drive New Urban Arts? What values are embedded in your own creative practice? What value would you like to incorporate in your mentoring practice more this year? What is it about the arts that reaches deeply the capacity of humans? What are models that link the arts with social change? What is the change you are committed to? What paths are you considering outside and beyond the NUA studio? We reflect on the year at New Urban Arts and think about the future of our individual work. no, no, no! we’re not done yet!
. . . but we’ll let you peak. Our first student gallery exhibition of the year was last Friday, January 30. "Mid Year Makings: An Exhibition of Works in Progress" is an inside look into the everyday happenings at New Urban Arts. As we were installing the show last week, it became really exciting to create an entire exhibition around works that aren't yet finished. Students and mentors chimed in to define in their own words what "mid year makings" are to them. This is a collection of their responses. Enjoy! Mid Year Makings are . . .
How we got to know our mentors. About taking risks and trying something new. The ice cream sundae, minus the cherry on top. Born from curiosity - and freedom. What happens in my favorite place in the world. A gigantic omelet everyone adds their own ingredients to. Voices bubbling to the surface, marinating, perculating. Connecting the dots between the days. Where we are now and where we’re heading.